Planting a tree in Israel is a multifaceted blessing. In essence you are establishing your roots in the land and partaking in the promises of Genesis 12:3, “I will bless those who bless you…”, but more importantly you are benefitting the people of Israel by transforming a barren region into a fruitful and productive land that is helping to create jobs, provide needed irrigation and sustain the local community. 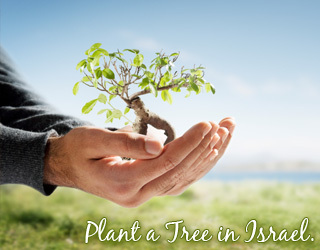 For only $30 you can plant a tree in Israel; for your family or in honor or in memory of a loved one. You can plant as many trees as you like and with your donation you will receive a certificate to commemorate your participation.